The Navigator V's new trip technology redefines route planning by allowing users to create longer and more detailed tours with up to 3,750 reference points per trip. The navigational instructions – e.g. via Bluetooth using the BMW Motorrad communication system – are partially spoken using real landmarks. For example…instead of saying "turn left in 100 feet" the system can say: "turn left at the white church." Map zooming is finely graduated and offers navigational tools such as a lane assistant and 3D building display in many cities. Another routing feature is PhotoNavigation: Geo-coded pictures stored in the device can be clicked on to start navigating towards that location. The unit features a fully-fledged travel computer, a home function for fast routing to the home address and beeline off road way point navigation. A free Garmin Smartphone Link app is available from Google Play and iOS. After pairing the smartphone with the Navigator V, users can receive weather and traffic information. 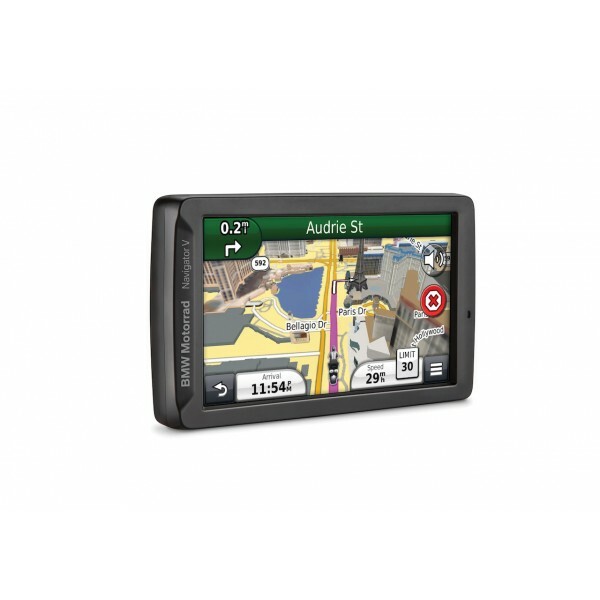 The Navigator V is compatible with the free Garmin Base Camp route planning software, which can create routes and way points that can be tracked and transferred to the navigation device. The Navigator V comes with pre-installed map data for Europe and features lifelong access to map updates (Lifetime Map Updates - LMU). To better plan routes, users can download the Base Camp tour planning software free of charge at www.garmin.com or install it directly from the installation file on the navigation device itself. Memory capacity of the Navigator V can be expanded from 8 GB up to 64 GB using an additional SD card (not included).